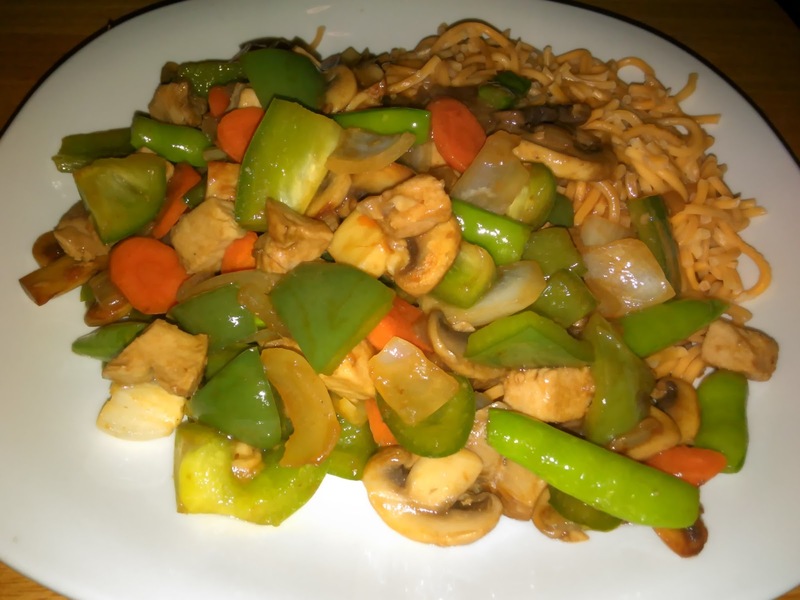 An easy stir fry. I finely diced and caramelized half an onion together with the mushrooms and carrots. Then the remaining onion, diced large together with the green pepper and celery were added and sweated. A few drops of sesame oil, then the cubed pork left from the roast was added with the sugar snap peas. I sprinkled a teaspoon of beef stock powder over the pan and half a teaspoon of flour. I cooked the flour taste off for a minute, tossing the pan. Then added 1/4 cup water and toss to coat. A dash of soy sauce to season. Drop the chow mein noodles in a pot of boiling water and immediately turn it down as it will boil over. Boil the noodles for a couple of minutes till softened. They can be plated directly and topped with the main dish or they can be fried with soy sauce for more flavour. They can also be put directly into the pan with the rest and served as one dish. I haven't done a stir fry for a while and I really enjoyed it.